Promotional Sun Ray Crystal Lens Sunglasses are available in Blue, Orange, Royal Blue, Lime Green and Red colors. They have an overall dimension of 1.25" H X 6" D and are made of plastic. The classic folding style eyewear is offering 0.38" H x 1.50" W imprint space to display your brand logo in style. UV 400 protective lenses are the main feature of these custom Oahu sunglasses that allow them to present exceptional protection against the harmful rays of sun. Best for outdoor events and activities, make your imprinted new arrival sunglasses order today to earn free online proofs, free artwork design and lowest price guarantee offers. 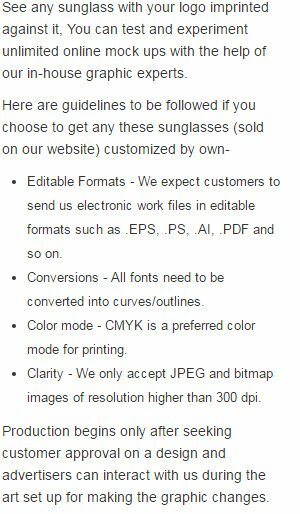 Request a quote to know what you can save on ordering these Promotional Sun Ray Crystal Lens Sunglasses in bulk.